It's bitterly cold out, and snow has been lightly blowing off and on all day. It's going to be colder soon. MUCH colder. I've drug my feet about putting out a bird feeder until we know what's going where in the yard. Still, the songbirds come seeking refuge. 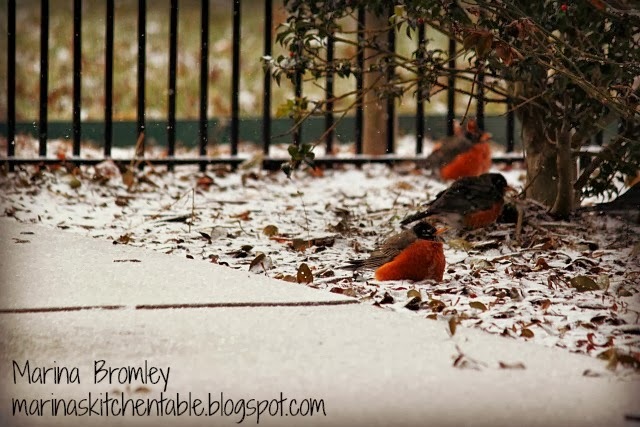 Today a large group of robins were clustering off of the patio, hiding under the bare rose bushes and eating the holly berries in the trees and drinking from the few unfrozen puddles on the patio. It reminded me of the need for clean water for them, and that God's providing despite my lack of movement in feeding them. I'll pick up some seed for them anyways, and see if we can find a spot for me to feed them where I can catch some photos... and just enjoy their beauty. Especially with the single digit (and negative??) temps creeping in over the weekend. Father, thank You for providing for the birds of the air, and the trees of the field. I ask Lord, that You will help me to remember to do my part, and also help me to remember that as much as You provide for them, You will provide for me. Help me to remember this in every season of life... in plenty and in need... and help my heart to hear Your prompting as You desire us to help others. Let me always be willing. Use us Lord.